The I/O manager gives each driver in a chain of layered drivers an I/O stack location for every IRP that it sets up. Each I/O stack location consists of an IO_STACK_LOCATION structure. The I/O manager creates an array of I/O stack locations for each IRP, with an array element corresponding to each driver in a chain of layered drivers. Each driver owns one of the stack locations in the packet and calls IoGetCurrentIrpStackLocation to obtain driver-specific information about the I/O operation. Each driver in such a chain is responsible for calling IoGetNextIrpStackLocation, then setting up the next-lower driver's I/O stack location. Any higher-level driver's I/O stack location can also be used to store context about an operation so that the driver's IoCompletion routine can perform its cleanup operations. The Processing IRPs in Layered Drivers figure shows two I/O stack locations in the original IRP because it shows two drivers, a file system driver and a mass-storage device driver. The driver-allocated IRPs in the Processing IRPs in Layered Drivers figure do not have a stack location for the FSD that created them. Any higher-level driver that allocates IRPs for lower-level drivers also determines how many I/O stack locations the new IRPs should have, according to the StackSize value of the next-lower driver's device object. The following figure shows the contents of the IRP in more detail. 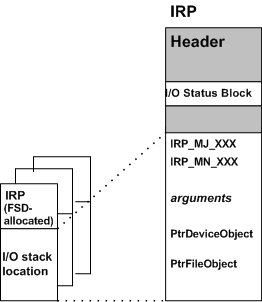 A file system driver accesses the file object through its I/O stack location in IRPs. Other drivers usually ignore the file object. IRP_MJ_PNP — perform a Plug and Play operation on the device. An IRP_MJ_PNP request is sent by the PnP manager through the I/O manager. IRP_MJ_POWER — perform a power operation on the device. An IRP_MJ_POWER request is sent by the power manager through the I/O manager. For more information about the major IRP function codes that drivers are required to handle, see IRP Major Function Codes. In general, the I/O manager sends IRPs with at least two I/O stack locations to mass-storage device drivers because a file system is layered over other drivers for mass-storage devices. The I/O manager sends IRPs with a single stack location to any driver that has no other driver layered above it. However, the I/O manager provides support for adding a new driver to any chain of existing drivers in the system. For example, an intermediate mirror driver that backs up data on a given disk partition might be inserted between a pair of drivers, such as the file system driver and lowest-level driver shown in the Processing IRPs in Layered Drivers figure. When this new driver attaches itself to the device stack, the I/O manager adjusts the number of I/O stack locations in all IRPs it sends to the file system, mirror, and lowest-level drivers. Every IRP that the file system in the Processing IRPs in Layered Drivers figure allocated would also contain another I/O stack location for such a new mirror driver. A higher-level driver in a chain of layered drivers can safely access only its own and the next-lower-level driver's I/O stack locations in any IRP. Such a driver must set up the I/O stack location for the next-lower-level driver in IRPs. However, when designing such a higher-level driver, you cannot predict when (or whether) a new driver will be added to the existing chain just below your driver. Therefore, you should assume that any subsequently added driver will handle the same IRP major function codes (IRP_MJ_XXX) as the displaced next-lower-level driver did. The lowest-level driver in a chain of layered drivers can safely access only its own I/O stack location in any IRP. When designing such a driver, you cannot predict when (or whether) a new driver will be added to the existing chain above your device driver. In designing a lowest-level driver, assume that the driver can continue to process IRPs using the information passed in its own I/O stack location, whatever the originating source of a given IRP and however many drivers are layered above it.